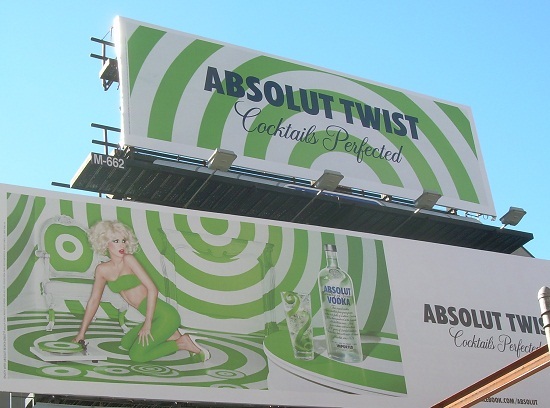 Here we have an Absolut billboard that at first seems to be very similar to their Lemon Drop Citron ad. Both feature a blond model and a bottle of Absolut on a table. Actually, the communications could not be more different. In this Twist ad, the table is quite prominently set just for one. The room is characterized by a series of circles — large letter “Os” — that make up targets with the focus as dots at the center. The model is about to make music by herself with a phonograph — a machine that works by an arm acting on a round record. This particular record player arm is of a rather unusual tool-like appearance. The model’s skin-tight clothing is the same color as the circles and the target. Unusually for a liquor ad, the model is not gazing longingly out of the picture at the viewer or above (or eyes closed) in rapture. Instead, home alone, the green-clad blond casts a worried glance to the right as if to make sure that she won’t be disturbed. What’s there to hide? The Absolut Twist ad — unlike most other liquor pieces — is aimed at women. Beyond the brand, drinking alone is what’s being promoted. The message is that solitary imbibing is just another acceptable way for adults to entertain themselves.